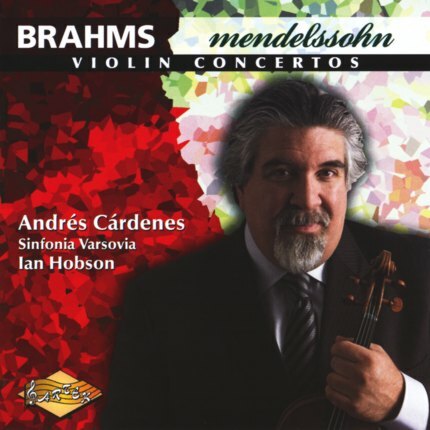 Andrés Cárdenes, a former student of Joseph Gingold at Indiana University, prize-winner in the 1982 Tchaikovsky Competition, and distinguished professor at Carnegie Mellon University in Pittsburgh, plays Brahms’s Violin Concerto with undeniable technical and musical command. Passage after double-stopped passage rings out with the clarity and assurance of a string quartet. Rising so authoritatively above the orchestra in the first movement of this massive work—with what seem to be reserves of tonal strength—can’t be so easy as Cárdenes makes it sound. Ian Hobson makes of the Sinfonia Varsovia a tautly rhythmic juggernaut, matching but never overpowering his soloist. Their white heat in the first movement reminds me of Leonid Kogan’s performance with Kiril Kondrashin and the Philharmonia Orchestra, a barnburner among barnburners (Kogan especially prized Brahms’s Concerto and Mozart’s Third). Cárdenes’s lyricism in the second movement proves that, pace Sarasate, the oboe doesn’t have the piece’s only good tune; his tone, as in the first movement, sounds thick as molasses in its lower registers and tensile and strong in the upper ones. He never spoils a line by lingering, never spoils passagework by rushing. Accordingly, the finale is perhaps more massive and deliberate than ethnically colorful or giocoso. But this movement’s performance fits with that of the Concerto’s other two movements. As in the case of Oistrakh, nobody should be tempted to accuse the soloist (as they had Heifetz) of superficial brilliance. The recorded sound represents Brahms’s rugged acoustic landscapes with stirring fidelity and the soloist with breathtaking presence. Cárdenes and the orchestra seem to have a special affinity for the stormiest passages in Mendelssohn’s first movement, which they lace with heart-pounding adrenaline. For Cárdenes, the recitative-like sections that lead to the cadenza represent a dramatic climax, which he mounts with such affirmative power that even the most authoritative passages in the cadenza might seem anticlimactic. Once again, Hobson and the orchestra provide a sonorous, rhythmically bracing, accompaniment. The slow movement’s darker middle section and the finale’s episodes provide the kind of dramatic moments in which Cárdenes and the orchestra can revel. His may not be elfin Mendelssohn, such as that in which Heifetz or the less driving but nevertheless cracklingly electric Francescatti could dazzle listeners, but its dramatic outbursts offer a complementary, more histrionic, and equally idiomatic view of the Concerto. Cárdenes’s two committed performances, in recorded sound of elemental strength and definition (befitting the soloist’s large-scale conception and the orchestra’s Gibraltar-like accompaniment), deserve a strong recommendation, even for those who believe their collection of the violin’s central literature needs little augmentation.